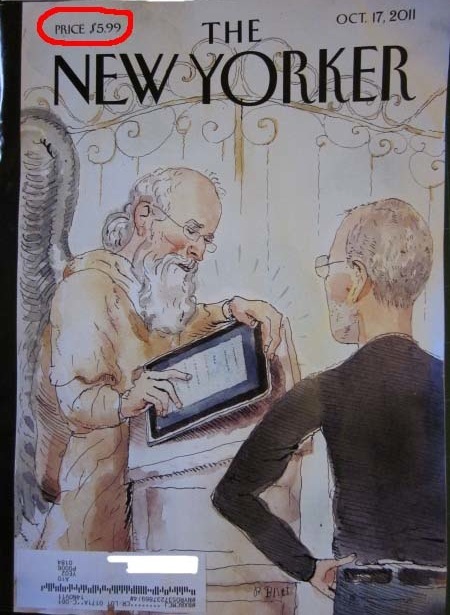 This entry was posted in Humor and tagged amazon, magazine subscription, renewal rates, the new yorker. Bookmark the permalink. I’m sure there would be a lot of takers, but any chance you could will me the remaining issues of your subscription in the event of your unfortunate and untimely death? I can forward an address at your convenience. I have to run that by Coco, Kathy. I already told her she gets all my toys and cameras and what remains of my subscription should I buy the farm before it runs out, but she’s an agreeable type so she might let you inherit the Conde Nast side of things. Not that what you asked for was outrageous, but what I got from this is ask for whatever you want, and you just might get it. 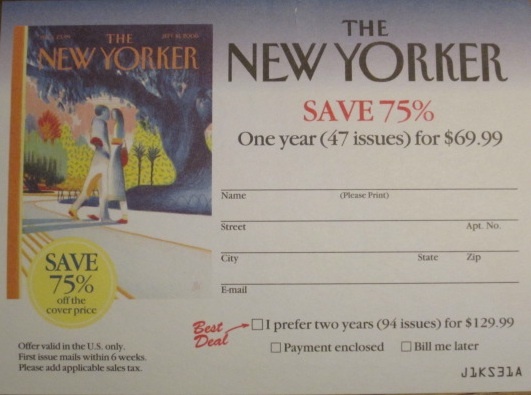 You’ve got that right, at least when it comes to renewing a subsciption to The New Yorker, Edward. I knew you’d appreciate the shout out about your unintended mischief-making, Max! You are sooo funny. As a customer support rep, I can’t wait for the day that someone asks me what happens if they die. I better start thinking of a response now. I would have thought you would have heard it all by now! I LOVE it. 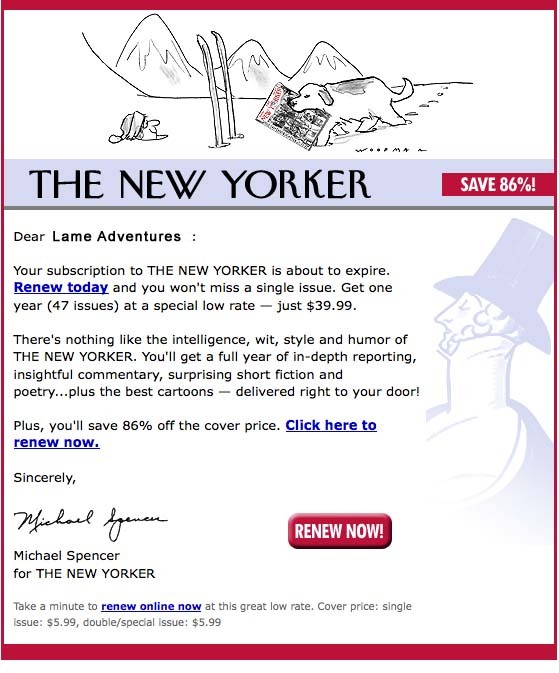 I’ve experienced a similar situation with the New York Review of Books — renew for $69.95 or, after 25 unanswered renewal notices, $49.95. What worked best in this case was just not to renew. Until they sent me the “Oh, puleeeze” offer of $14.95. Now it’s time for renewal again. Opening bid, $49.95. I get “your subscription is about to run out” notices from magazines just after I’ve renewed. I get so confused I forget to renew. When I told this to the Atlantic CSR, she said, “Oh, O.K. We’ll send you only one near renewal time.” So far, they’ve kept their word. Too bad long-time subscribers like us couldn’t hold off renewing our subscriptions for so long, the publishers would just relent and let us have our periodicals for free.